Delta, the Official Airline of the Atlanta Super Bowl Host Committee, will be the first to welcome football fans around the U.S. as they arrive in Atlanta — from the die-hard followers of New England to the charged-up fans of Los Angeles, and all those looking for a do over next season. 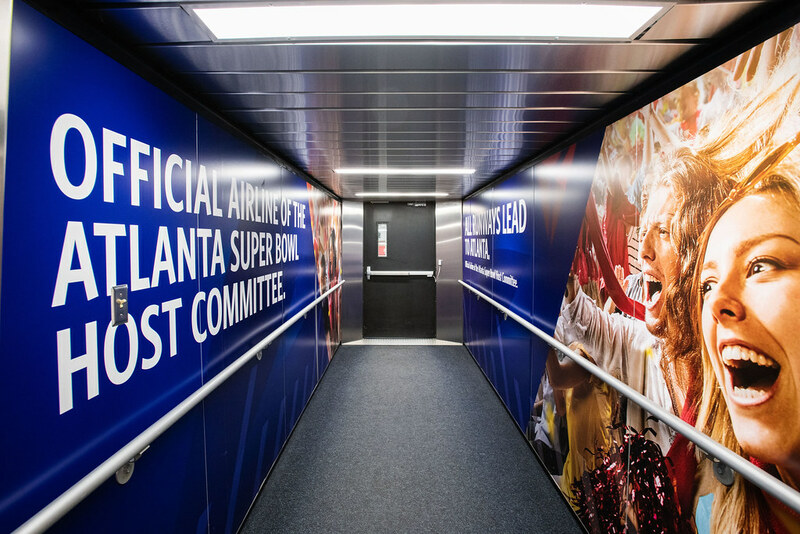 Delta has created an immersive experience of football imagery and sound effects in seven high-traffic gates in each concourse — T8, A18, B20, C33, D12, E26, F10 — as well as in baggage claim and check-in areas. Teams, the network, league and tens of thousands of fans are expected to travel through Atlanta for the Big Game starting Sunday, Jan. 27. When customers deplane at each of the thematic gates, they’ll be greeted with sound effects of fans cheering, game plays and music to get them pumped for Sunday night football. Customers will also find football elements throughout the airport on passenger assistance carts, door frames, baggage claim carousels, self-service kiosks and floor graphics. Whether landing in Atlanta or returning home after the victor’s been crowned, Delta is taking customers on a branded journey from arrival to departure.